Our annual Healthy Speakers Series brings knowledgeable professionals to Active Aging, Inc. senior centers around Crawford County to present a number of topics relevant to senior citizen health including diabetes, Alzheimer’s, exercise, healthy diet, and more! 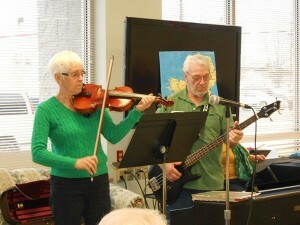 Active Aging, Inc. offers many ways for individuals 60 and over to continue learning into their later years. There are art classes, music classes, current events, history, card parties and photography. 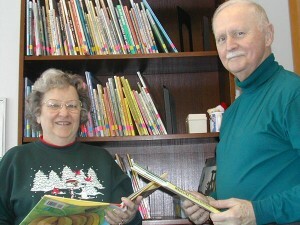 Our center houses a small library of fiction and nonfiction books for our seniors to enjoy! If you have a suggestion for a special class or topic, see a center manager to discuss your idea! 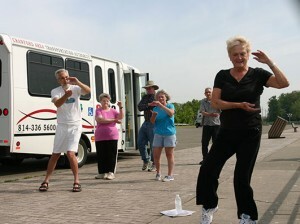 We offer several types of exercise classes to keep seniors active. These include ballroom dance lessons, Tai Chi, Chi Kung, Yoga, and Healthy Steps in Motion. These programs are adapted for all ability levels. We also offer an area with treadmills, bicycles, and free weights that are available for use. Come and try out Wii Bowling or other fun video programs to keep you active. Join us for lunch at any of the centers! For a small donation, enjoy delicious and nutritious meals every weekday. Our lunches are usually a full course, hot dinner that includes an entrée, vegetables, bread, fruit or dessert. Check out all our great menus for the month in the Echo. We ask that you make reservations at least two days ahead of time. Call your local center or use our Co-Pilot system (electronic) to sign up ahead of time for all of our events and activities. This health and education program focuses on a wide variety of health promotion and disease prevention activities. The programs offered center around exercise, nutrition, chronic conditions, behavioral health, injury prevention, medication management and health screenings. The two major components are Healthy Steps and Chronic Disease Self-Management. Silver Sneakers is offered in conjunction with the Meadville YMCA. This fitness program is designed to address the exercise needs of older adults in a social environment. With Silver Sneakers you will improve your flexibility, help control your weight and increase your range of motion. Would you like to come down, have a cup of coffee, catch up on local news and chit-chat? This is the place! Cool when it’s hot and warm when it’s not! Enjoy a welcoming atmosphere and opportunities to participate in an array of activities and programs as you desire.